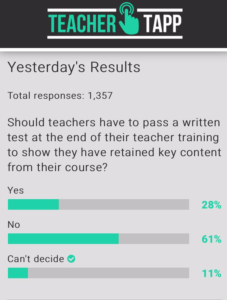 Home » Blog » General » Should teachers have to pass a written test? When Will Millard showed me the first draft of our Testing the Water report and I saw his suggestion that teachers should pass a test on their understanding of assessment, I quickly got out the red pen. Another test? What a gimmick? I quickly decided that recommendation wouldn’t make the final cut. Yet by the time I reached the end of the report Will had persuaded me and it became one of my favourite recommendations. Today thanks to a poll of over 1,300 teachers by Teacher Tapp, we know that over 60% of teachers share my initial reservations. But over a quarter think it could be a good idea, and another 10% are undecided. So why did my view shift? Why did I go from the comfortable position of agreeing with the majority, to thinking a test could be a real game changer? What are we currently assessing? I have had the privilege of training and assessing teachers on PGCEs, Teach First, the Graduate Training Programme and School Direct. The approach of triangulating between different views from university tutors and school-based mentors – formed over the course of the year, as well as a portfolio and a final assessment is a great way of getting assessing what a teacher is like and how they support their pupils. You get a sense of their ability to communicate with a class, how they put together lessons, draw on theory, reflect on what they have done, and then refine their practice. These will always be the things that matter and this shouldn’t change. Part of the strength of the current approach is that it’s not a tick box exercise. But there’s the rub. There are a few things that do require a tick box approach – things all teachers should know and which are hard to assess under the current system. It would be far easier and more effective to test these, leaving tutors and mentors free to focus on the practical skills. If a teacher has a safeguarding concern I think they need to know what to do about it: the helplines they can call for advice or when they should disclose a concern. Trainees will often have evidence that they have attended training, or will share an example of a time when they’ve dealt with a concern. But that’s not an effective way of checking they know a few key things that everyone should know. The fact that little Johnny got 65% in his ‘Greeks and Romans’ test last term and 70% in his ‘Egyptians’ test this term doesn’t mean he has necessarily ‘made progress.’ Understanding why this is requires some basic assessment literacy, for example confidence intervals and comparability. A test would be a quick and simple way of checking they have acquired the necessary understanding. If a teacher sees “SLCN” on the information they receive about a pupil from a Primary School they should probably know what this means and what they might consider doing about it. This holds regardless of whether a teacher happens to have taught a child with SLCN. These are just a few examples of things we might want teachers to know. Exactly what knowledge is needed is contestable and should perhaps be included in tomorrow’s consultation on QTS. However, the above examples are things that could helpfully be checked in a test. 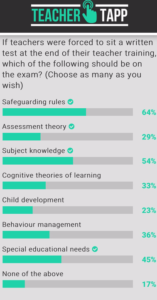 Today’s Teacher Tapp poll suggests that safeguarding comes top of the shortlist of test-topics amongst teachers (selected by 64% of teachers). Subject Knowledge comes second at 54%. Our Testing the Water proposal around assessment was selected by 29% of respondents. By putting together a list of things like these and assessing a sample of the ‘teaching curriculum’ every year at the end of ITT we could ensure that there is a core of information that all trainees learn. A lot/most of what’s involved in being a great teacher is not stuff that could (or should) be checked in a multiple choice test, but some of it is. Lawyers, accountants and doctors have to demonstrate their competence through practice, but there is also a body of knowledge they have to acquire and demonstrate in exams. There is surely nothing inherently objectionable about teachers having to do the same? Clearly set out knowledge that teachers should master could be mapped out well beyond ITT. 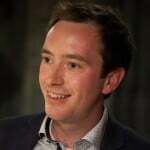 We could plan out, for example the basic knowledge someone needs in order to start teaching; what they might learn after their NQT year to become a fully qualified teacher; and then, what they might need to know as an ‘expert’. We could even link particular curricula to different pathways (as subject experts, pastoral experts, SEND experts etc). Again, these could never just be assessed through a test, but it’d make sense to have tests as part of the mix. Doing so might even help us move towards clearer trajectories for teacher career progression.